SINGLE TICKETS: General $38, Senior $35, 25 & Under $12, Previews $16 / $10 Youth. (Seniors age 65 and older.) To order Tickets, click on the performance date of your choice, which you will see on the Calendar of Performances below. BUY SEASON TICKETS: $90 General, $84 Senior, $30 25 & Under Admission to any one performance of each play. Includes reserved seating, seat cushions, and complimentary exchanges whenever you change the date you’d like to attend. BUY BARD PASS: Eight tickets for $264 Eight tickets good for any performance, any show, all summer long. BUY FAN-ATIC PASS: $160. Good for any and all performances all summer long. Non-transferable – plus, get a free seat cushion every time you attend. SHAKESPEARE DINNERS: $35, play ticket & beverages not Included. Enjoy a scrumptious catered dinner and intimate pre-show Talk (Info & Menus) To order Dinners, click on the date of your choice, which you will see on the Calendar of Performances. Make sure to purchase tickets for the Play separately from your Dinner Tickets. 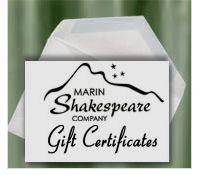 BUY GIFT CERTIFICATES: Purchase Gift Certificates for single tickets, Season Tickets, Bard Passes, and Dinners. PAY YOUR AGE: If you are between the ages of 26 and 34, you may Pay Your Age when purchasing tickets at the Box Office on the day of any show with a valid I.D. FAMILY DAYS: At these performances, Youth 18 and Under are FREE. Join us for fun activities at 3:00 pm prior to the start of the show. SENIOR MATINEES: At these performances, Seniors pay half-price, just $17.50. To order tickets for performances and Dinners, click on the performance date of your choice, which you will see on the Calendar of Performances below (coming soon). * Please make sure to purchase tickets for the Play separately from your Shakespeare Dinner Tickets. • Previews – Be among the first to see the show! $16 Standard or Senior, $10 Ages 25 & Under. • Opening Nights – Enjoy complimentary champagne and chocolate cake. • Saturday Shakespeare Dinners start at 6:30 pm and include a gourmet picnic and intimate pre-show Director’s Talk. • Friday Night Pre-Show Conversations begin onstage at 7:15 and continue until 7:45 pm. • Family Day Matinees – Youth 18 and under are FREE; family activities start at 3 pm. • Senior Day Matinees – Seniors age 65 and older may purchase half-price tickets. • Post-show Q&A’s – Meet and hear from the actors and director. • Shakespeare’s Birds Walk/Talk – Join birder Linda Swanson at 5:30 pm for a free walk around Forest Meadows looking and listening for native species. Then, join the Shakespeare Dinner where Dramaturg Mary Ann Koory will talk about birds in Shakespeare. Click here to learn more about Birds in Shakespeare. • Student Matinees – 11 AM shows for school groups; also open to the public. • Group Tickets – Contact our Box Office at 415-499-4488 for information about discounts for groups of 10 or more. To see our Ticketing and Privacy Policies, click here.